Unlike us, bears have discovered the enviable secret of eternal youth. An eighty-eight-year-old Rupert? Ridiculous! A seventy-eight-year-old Mary Plain? Unthinkable! An eighty-eight-year-old Pooh? Preposterous. 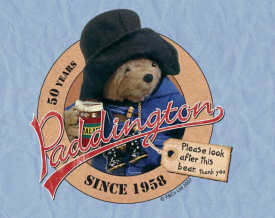 And as for a fifty-year-old Paddington – you must be joking! How can a bear who creates mischief and mayhem wherever he goes – admittedly a bear whose sole aim in life is to be helpful and polite, but who is unfortunately accident prone, impulsive and always in deep trouble – be well on the way to collecting his bus pass? Bears always find an age with which they are comfortable and stick to it. So, believe it or not, Paddington really does celebrate his fiftieth birthday this year. 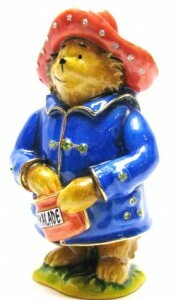 Pictured right: Paddington Bear with Marmalade Hidden Treasures from Arora Design – each figurine has a secret compartment containing a hidden treasure. What actually is Marmite? Well, it’s a spread made from yeast extract, vegetable extract, salt and various spices and, as the adverts proclaim, ‘You either love it or hate it’. You certainly can’t be indifferent to that tangy, tongue numbing taste. Although Paddington has been weaned off the marmalade for a while to promote the new, squeezy Marmite, I’m sure it won’t be long before he reverts to his favourite marmalade chunks. A marmalade-free Paddington is about as unthinkable as a Paddington who has lost his duffel coat and floppy hat. When Michael Bond found a small toy teddy bear on a shelf in a London Store on Christmas Eve 1956, he decided to buy it as a present for his wife. He called the bear Paddington. Just for fun, he wrote some stories revolving around the bear, and after a few days realised he had a book on his hands. However, he admits that while he was writing he didn’t consciously set out to write a children’s book – which is good, because, as all Paddington enthusiasts know, the books are far too special to be the sole prerogative of youngsters. Eventually, the book was placed with William Collins and Sons (now HarperCollins), and illustrator Peggy Fortnum was commissioned to produce the delightful sketches which complemented the stories so well. ‘A Bear Called Paddington’ was published in 1958, and as we all know, the rest is history. Amazingly, the Paddington series of books have sold over thirty million copies world wide and have been translated into thirty languages. As the birthday bear’s big day approaches, as well as planning his party shopping list and putting both Marmite and marmalade at the top of it, how else will Paddington be celebrating? For starters, he will be starring in a new book, the first Michael Bond Paddington Bear book to be published for thirty years. Rumour has it that a mysterious stranger will cause Paddington to reflect where home really is – surely he won’t forsake 32 Windsor Gardens and return to darkest Peru? ‘Paddington Here and Now’ will be published in June, while in October, to commemorate the publication of that very first book, HarperCollins will issue a special anniversary edition of ‘A Bear Called Paddington’. And there’s more – in March, as part of World Book Day, a £1 read, ‘Paddington Rules the Waves’, will be amongst the titles on offer. There will be plenty of new Paddington Bear collectables and merchandise this year, too, including a new Steiff creation. As we all know, Paddington was first discovered by Mr and Mrs Brown on Paddington Station, hence his name. The optimistic little refugee was sitting hopefully on a suitcase containing his worldly goods, and Steiff have depicted him, carrying his case, in a limited edition of 1,500 pieces. 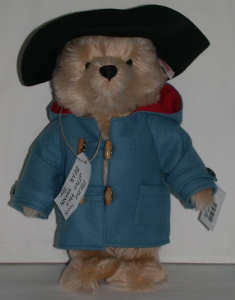 This 11 inch tall Paddington wears a pale blue coat and is complete with a gold-plated button-in-ear. 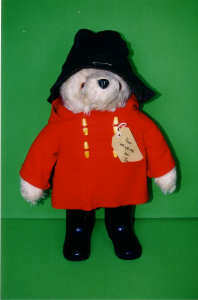 He is based on the FilmFair Paddington Bear from the television series, a super bonus for fans of the animated episodes. 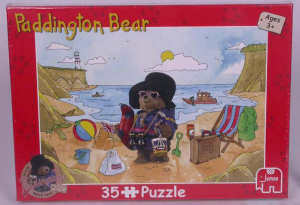 Other items include puzzles courtesy of Hausemann en Hotte/Falcon, while Robert Harrop has produced a gorgeous commemorative figurine of Paddington munching a marmalade sandwich (not a blob of Marmite in sight!). More planned Paddington releases include a commemorative coin, a pewter figurine, clothing, greetings cards, a cookery book and gift wrap, as well as a range of soft plush toys from Rainbow Designs. 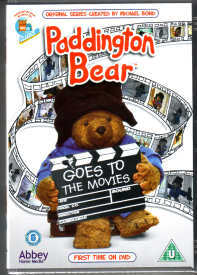 Blast Entertainment is developing and publishing Paddington Bear games for the Playstation2, while in anticipation of the anniversary, a DVD was issued recently called ‘Paddington Goes To The Movies’, which features the classic ‘Singing In the Rain’ sequence, starring, of course, the duffel coated dancer. And then we’ll all heave a sigh of relief, knowing that some things, especially in Paddington’s world, will never, ever change.